Eliminate steps and save time. Continuing to focus on saving time and making life easier for NAV users, DocumentPath provides a “Post and Send” action on document pages. 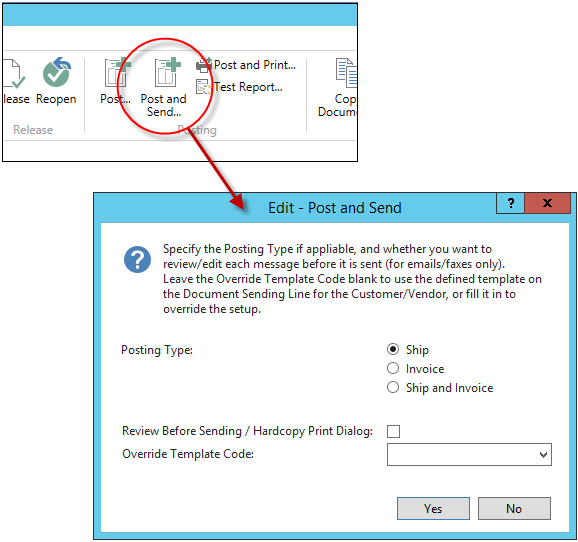 Post and send will post the respective NAV transactions and deliver (via email, fax or hardcopy, however the Document Sending line has been defined) the resulting documents in one easy step. In this case, if a “Ship and Invoice” posting is done on a sales order, DocumentPath will automatically email a copy of the shipment (a shipment notification), print a hardcopy of the shipment for the warehouse to enclose in the package, and email the resulting sales invoice. Deliver documents more easily, save time and get paid faster using DocumentPath to expedite sending processes.